Referential gestures in the grouper- great new work from our department! As part of everyday conversation we may point at an object we would like to draw attention to, or in the direction of something of interest. These are referential gestures – movements we make as part of the way we communicate information – which have previously been thought to be confined only to great apes (including humans), and more recently, ravens. New work has found, however, that signals are used by two coral reef-dwelling fish, the grouper (pictured) and the coral trout, to aid in cooperative hunting (Nature Communications 4; 2013). Groupers hunt in the reef habitats off Australia’s coastline, often teaming up with giant moray eels or Napoleon wrasse. 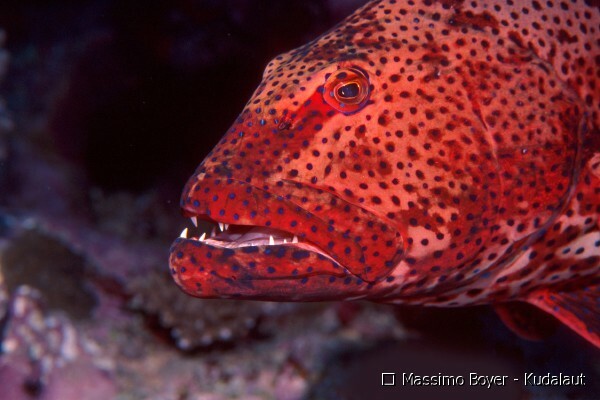 These other fish are able to access crevices in which the small fish that make up the diet of all three species may otherwise successfully evade capture by the grouper alone.The grouper’s role is to locate this prey, which can then be flushed out by the eel or wrasse. Andrea Manica and my contemporary Alex Vail (from down the corridor in the Zoology Department here in Cambridge), in collaboration with Redouan Bshary from Neuchatel, show that the grouper uses two signals which facilitate this collaboration. First, a “high-frequency shimmy” which acts as an invitation to the wrasse or eel to join a hunt – the grouper has found the prey. It then uses its body to point in a “headstand” to where the prey is hiding. Crucially, this information is processed and used by the other fish to locate the prey – the study showed that in 9 out of 10 instances where a grouper performed this headstand gesture, the wrasse or eel then inspected the location being pointed to. Alex et al. argue that the benefits of cooperation could drive the need for, and therefore the evolution of, communication through rudimentary physical signals. This is the first instance of a referential gesture being documented outwith the “large-brained” vertebrates, and may challenge the long-held assumption that few species have the capacity for language development. This paper puts forward evidence for a novel argument – that the development of communication may not be dependent on smarts, but on ecological need.